The Ketchup War Needs YOU!! So, here’s what happened, The Canadian One took me out to a fancy Spanish restaurant in Gangnam (yes, THAT Gangnam) last night for our Date Night. I donned a pretty dress my mother had bought me in Barcelona (a fact I remembered as we left the restaurant) and The Canadian One was sporting a shirt and tie. I was the type of restaurant where the waiter takes your coat and folds it nicely for you over a designated ‘coat/bag chair’ at your table. Food and wine ordered, we sit back and relax while the waiter brings us our bread and drinks. Now, the bread comes out warm (and perfect) and is accompanied on the plate by an oil and balsamic dip and a tiny plate with two marshmallows on it. I eat some bread and then turn my attention to the marshmallows. They look like marshmallows, they are the shape and size of small marshmallows and in the dark, they have the same texture. I try to jab my fork into one of them. No luck. I poke it with my finger and eventually pick it up and try to bite into it. It’s harder than I think so I place it on my plate next to my other food as our main courses arrive. Mine a pasta dish, his a paella dish. After a few moments, I turn my attention back to the marshmallow on my plate. Thinking perhaps it’s an after-dinner mint, I pick it up and try to bite off the corner of it. It starts to unravel. It’s at this point I pull the entire thing apart and realise it’s a wet napkin. I had just tried to eat my wet napkin. I have never, ever been more glad in my life that I didn’t just toss the marshmallow into my mouth and try to swallow it. I’ll give you a moment to shake your head. The Ketchup War needs YOUR help. 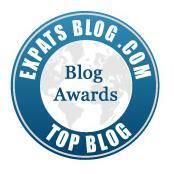 Not only does someone need to teach me the difference between a marshmallow and a napkin, we’ve also been nominated for an Expat Blog Award. Uh huh! Insert happy dance here. But we need YOU. 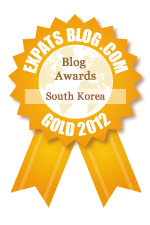 The winner will be announced in December and is based on reviews left on the site from its readers. That’s YOU! Just pop on over to The Ketchup War’s page and leave us an awesome review. You just KNOW you want to!